Digital natives coming into the workforce have high expectations of transparency, flexibility, training, recognition and responsiveness from employers. They are constantly seeking opportunities for personal growth, with a default expectation that these opportunities will be found at a new company. On the other hand, for employers attracting, engaging and retaining employees has become significantly harder. Digital has amplified the connection between internal company culture and the external perception of the organisation, by creating transparency between an organisation’s employees and its customers. Through digital customer service and social media sharing, customers have direct access to real-time interactions of the organisation’s staff. A compelling employee experience is a core driver of a compelling customer experience. For that reason, employees have the responsibility to present a consistent, coherent and compelling experience in all their customer interactions. While it has never been harder to engage employees, ensuring that they are aligned with the organisation’s goals, and understanding how they can best contribute to them, has never been more important. Employee engagement in the organisation is critical to delivering the business strategy and reaching business objectives. HR departments are shifting from simply delivering employee services to shaping and leading the business transformation necessary to remain competitive in the digital age. The challenge is finding how to translate business objectives and strategy into actionable insight that employers can embrace to attract, engage and retain the next generation of employees. Digital offers transparency – which can be unsettling for those used to carefully curating a polished image as the primary means to attract talent. Organisations should never shy away from the truth well-told. They should be frank and open about the nature and scope of the opportunity. Potential employees can easily canvas online resources to get an unvarnished view from others, so employers should be honest about the roles they offer, what they entail and what they lead to. Employees look for opportunities that fit their own personal interests and deliver fulfilment and purpose. Too many employers seek to impose a company culture through a regimen of orientation and training – unfortunately, these imposed goals seldom take root upon the individual. Being transparent about the opportunities within the organisation. Providing a personalised view of these opportunities. Letting the employees to naturally express themselves by using their strengths as a platform to frame their work. Helping them take control of their own career trajectory by giving them the right tools and information that will allow them to understand the areas where they need to grow. In all of this, employers should consider how best to share data, opportunities and tools across their organisation. They should leverage best practice from the consumer tools that employees will be familiar with, to push information to the front lines where employees will need it most. Feedback delayed is feedback denied – annual appraisals are antique. Today’s employees want to be heard, and expect to be rewarded for their performance in real-time. Digital allows organisations to track and measure employee activity as it happens, and ‘gamification’ techniques provide the means to socialise and incentivise performance. These capabilities deliver regular, ongoing transparent performance feedback and puts the means of improvement directly in the hands of the employee, so they can actively manage their own development. This data should also feed regular manager check-ins rather than annual reviews. Appraisals and setting objectives should be timely and relevant, and as a result more effective. Digital tools also offer the capability for organisations to quickly and easily capture workforce sentiment, to understand employees’ queries, interests and pain-points so that they can be identified and addressed. 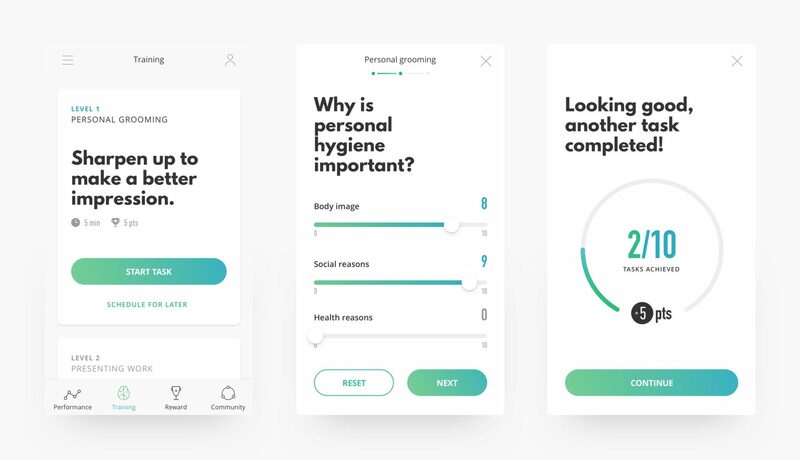 At ELSE, we design digital experiences that shape perception, motivation and behaviour. 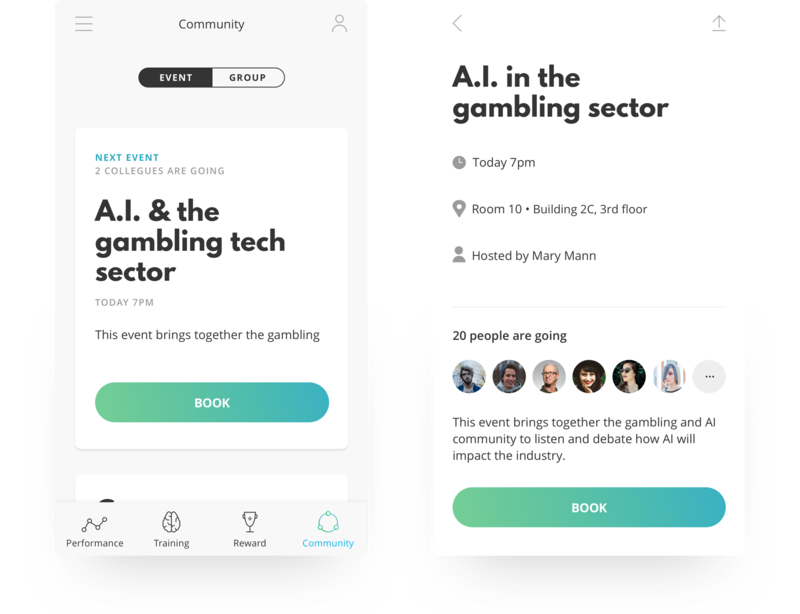 Using a combination of insights, cues and incentives, built on an understanding of rational choice, behavioural nudges and ‘gamification’, we build experiences that induce the right behaviour amongst staff. 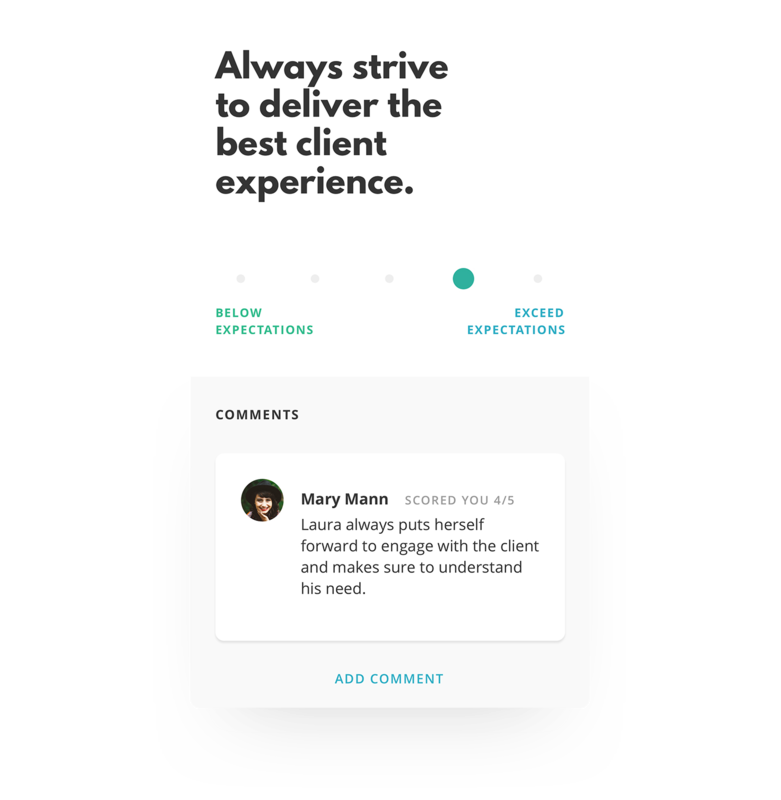 For a comprehensive employee engagement system, we’d envisage a staff app as the essential companion for new and current staff members. In terms of emotional takeaways, the app would provide them with a sense of belonging, togetherness and pride. Whereas in terms of experience takeaways, it would encourage and reward progress, naturally facilitate the creation of networks with likeminded people, and make a large corporation seem manageable, dynamic and exciting. 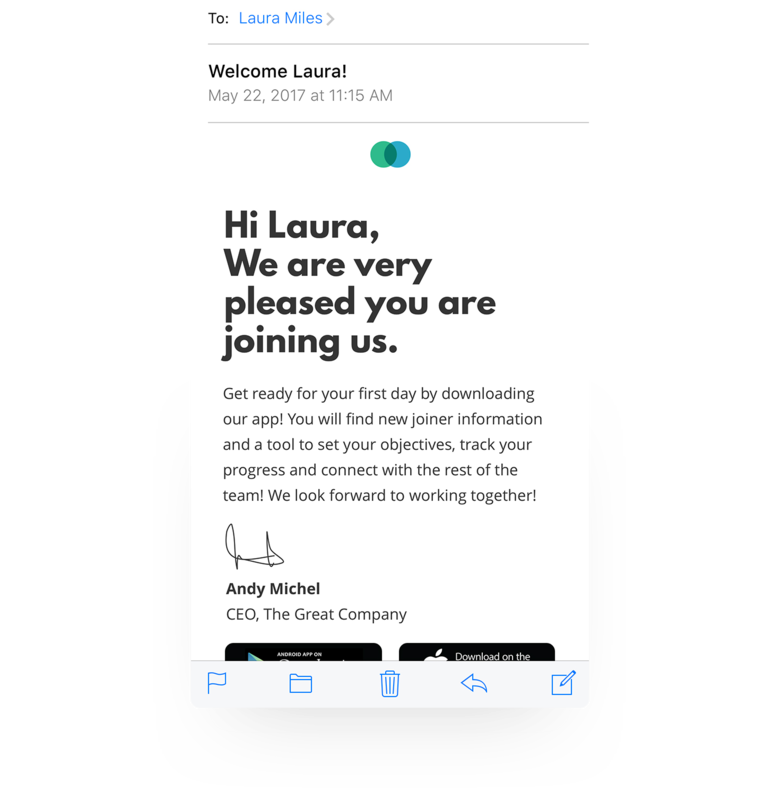 On joining a company, each employee is encouraged to download the Staff App. It contains essential new joiner information and other useful career orientation information – explaining the primary conduit for company and management communication. 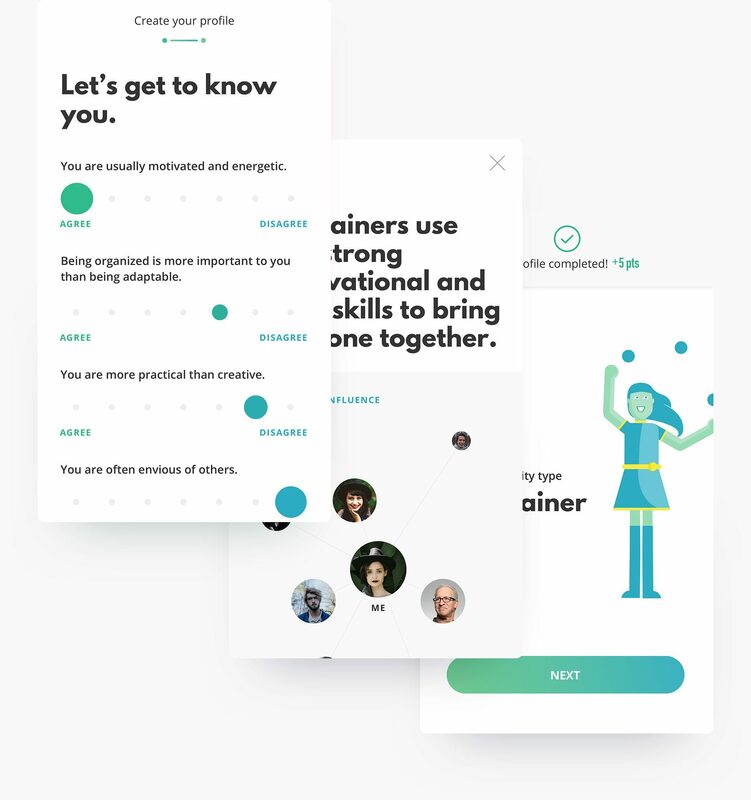 As a first task the user will need to tell the company a bit about himself, his strengths and interests. 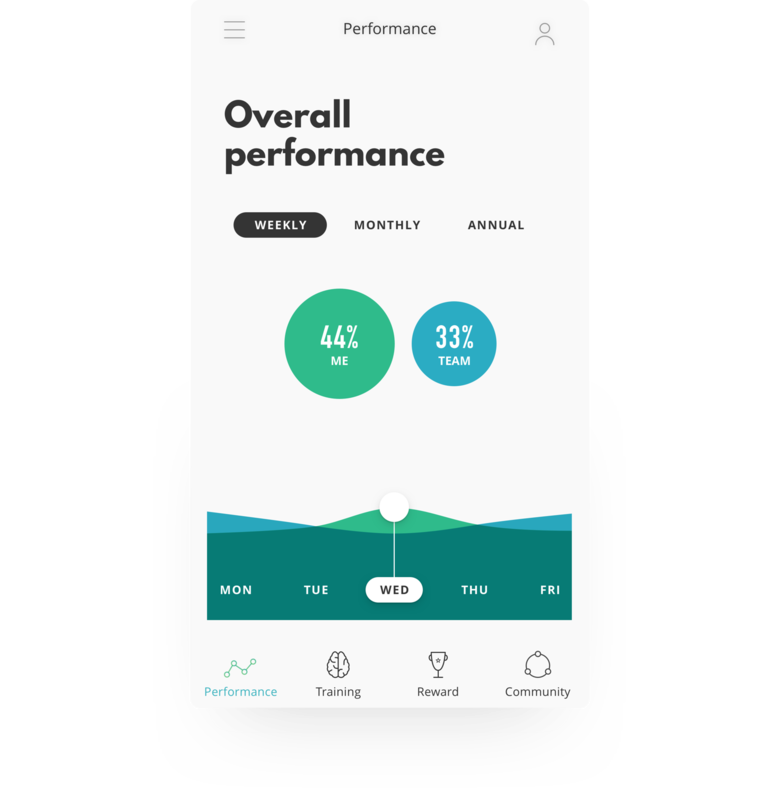 But more importantly, the app should provide employees areas where they can develop themselves, set and reach goals, track their progress, and claim rewards for their achievements. In addition, employees are also part of a team. So it’s important to illustrate the impact that their progress has on their team, and understand how their team performs compared to others. 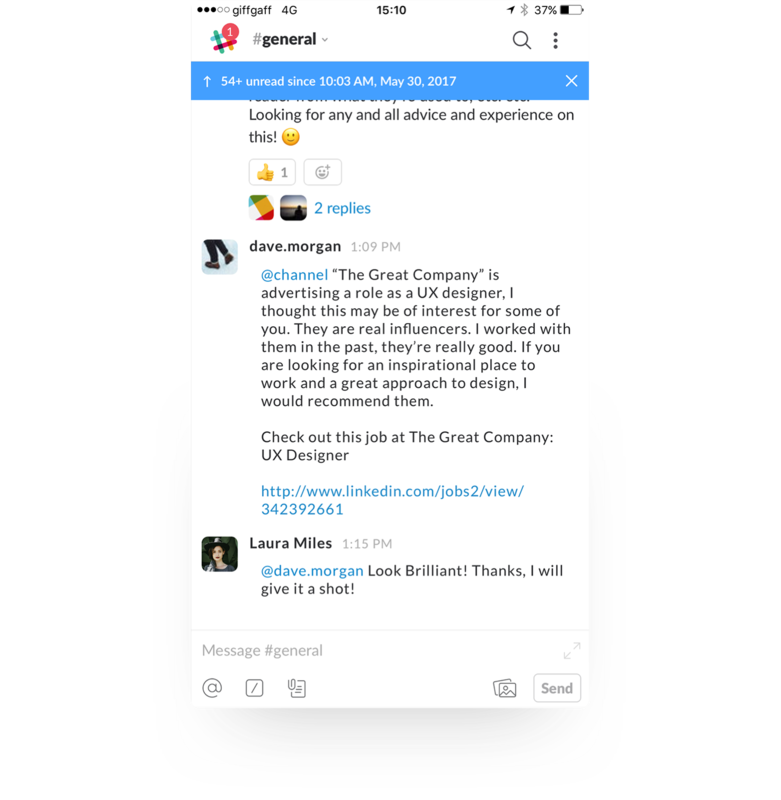 These two views – personal and team development – are presented as a default view in the home screen. The concept of levels allows us to provide a playful experience that gives employees incentives and the means for on-the-job learning and development. This creates a better environment that encourages people to tune their skill and get immediate feedback. 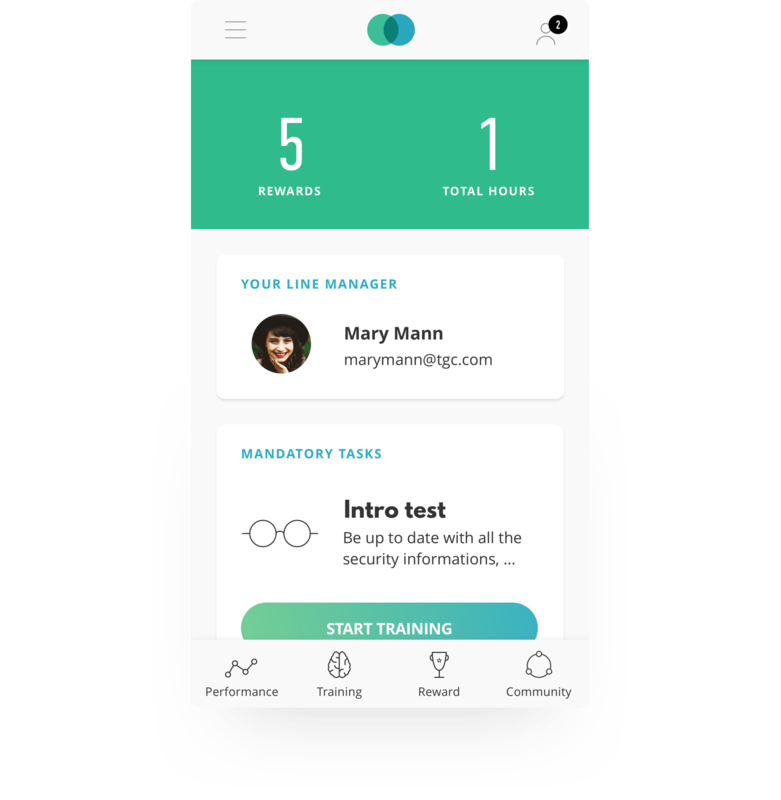 On the first level the employees will need to complete their personal information, review the progress indicators and complete their orientation. This first ‘Level Up’ gives them a positive feedback, clear indication of their progress, and guidances as to what to do next. Subsequent levels may be competency based – encouraging staff members to develop their skills, or ‘bonus levels’ – one-off campaigns that bring specific departmental objectives to the fore. Each level consists of a range of different ‘play’ tasks. These are in essence different ways in which to communicate information such as listicles, activities, games, videos, etc. with short tests to encourage retention. For an employee to progress to the next level, he or she will need to complete the tasks to achieve the required knowledge and master their competencies before progressing to the next level. Employees can see at any point how well they are doing – as an individual and collectively, and also identify their contribution to the team. By giving them visible insight into their progress, they can quickly grasp whether or not they have to ‘up their game’ and/or encourage others to do so. Digital can improve communication in three different ways. Firstly it provides immediate open lines of communication within the organisation. Secondly, it makes it easier for employees to see what opportunities are open around the company and raise issues with the management. And finally employees can get direct feedback from managers, and use digital tools as a simple means to set and review career objectives. Engaging an employee digitally gives managers an up-to-the-minute view of performance, and the chance to recognise and reward high performers in real-time. Exceptional performers can be offered the opportunity to mentor and advise others, be given access to unique opportunities and get automatically nominated for employee excellence awards. 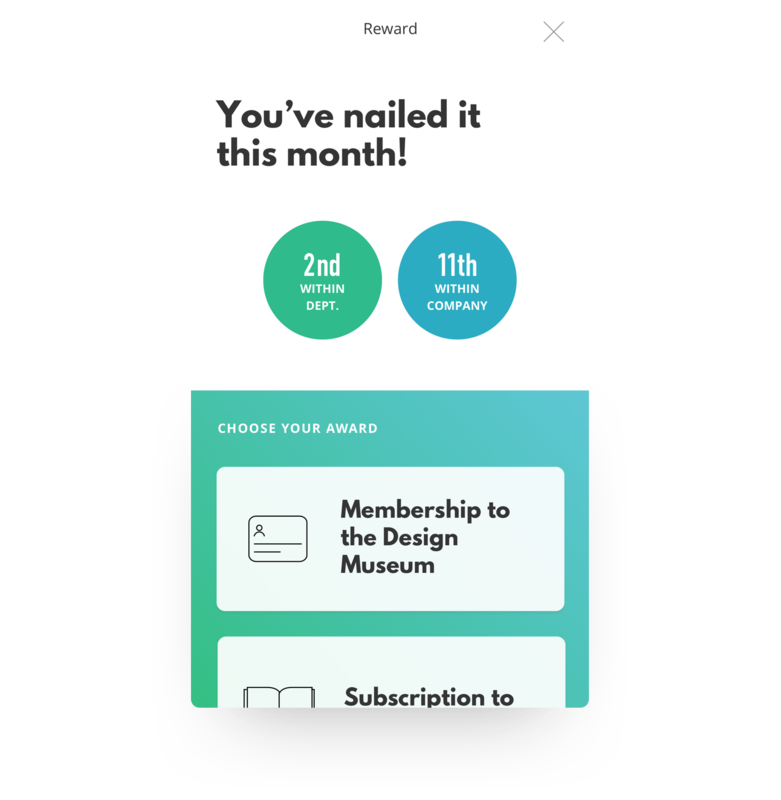 Digital also provides the means to deliver some of these rewards – allowing the employee to select from a range of possible bonuses for their achievements. Networking with other employees creates a strong sense of community and togetherness, which are important for morale and builds a sense of harmony. So in addition to monitoring and managing performance, a digitally-driven employee engagement programme can help build a sense of community. By gathering an employee’s interests, an organisation can match employees with things in common, suggest relevant groups and invite them to related events. A good engagement programme should give employees a place to share their experiences and build a profile and sense common purpose alongside their peers. As a whole, a digital employee engagement programme should provide an holistic experience of working for an organisation. In order to deliver that level of experience, the organisation needs to include a comprehensive set of services: From finding their way around, to engaging with others inside and outside of the working environment, to bettering themselves and developing personally and professionally, to communicating with the company. Ultimately, by making employees feel they are looked after, it will encourage them to willingly contribute to the company’s collective endeavour.